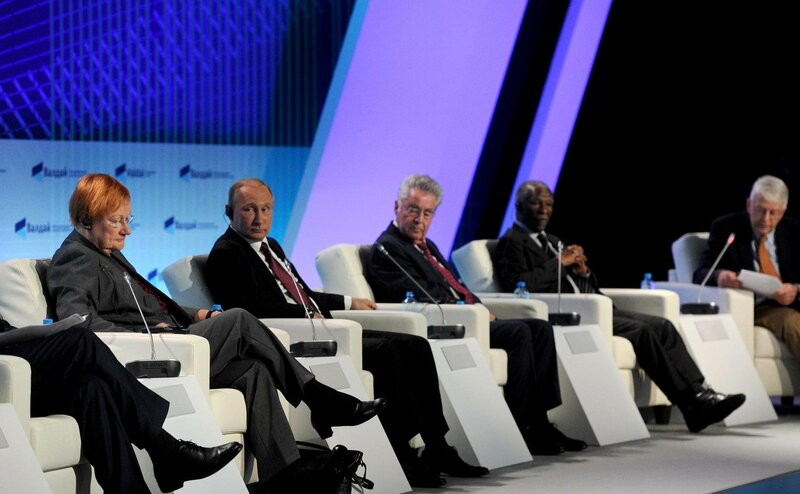 Russian President Vladimir Putin at a meeting of the Valdai international discussion club on Oct. 27. Russian President Vladimir Putin has dismissed as hysteria speculations Russia is meddling in the election campaign in the United States. "On the list of phantom problems, far-fetched problems there is the ongoing hysteria - I just cannot think of another word - over Russia’s alleged influence on the course of the current presidential election," Putin said at a meeting of the Valdai international discussion club on Oct. 27. He pointed out that the United States was faced with many problems - from the mammoth federal debt to police brutality. "But apparently the elite has nothing to say to calm public anxiety," said Putin. "It is far better to distract people’s attention with rumored Russian hackers, spies, agents of influence and so on and so forth. “Is there anyone who thinks in full seriousness that Russia is capable of influencing the choice of the American people somehow? America is not a banana republic, is it? America is a great power."